Libratone Q Adapt On-Ear review | What Hi-Fi? Libratone, Danish maker of the lovely wool-covered Zipp wireless speakers, is dipping its toes into the vast headphones market for the very first time with a pair of on-ear, portable, wireless headphones. The new Q Adapt On-Ears tick every feature you could want in headphones: portable, wireless, aptX Bluetooth, noise-cancellation, touch controls and even a smartphone app. At £220, this is a competitive and feature-packed pair of headphones. The Libratone Q Adapt On-Ears’ light but firm build makes them lovely to handle and wear. The finish, whether in stormy black or cloudy grey, is minimalist and smart. They’re compact and lightweight enough to carry around or sling around your neck when not in use, though we wish you could fold them up like the AKG N60 NCs or B&W P3s to make them even more portable. The earcups are small and grip your ears firmly, with comfortable cushioning on the cups and the woven headband. You can adjust the headband to fit all head sizes, and it doesn’t weigh down on your head after listening for long hours. Wirelessness is the key feature of Libratone’s first headphones, with aptX Bluetooth giving you cable-free access to streaming services and music stored on your smartphone. Pairing with smart devices is blissfully swift and painless. 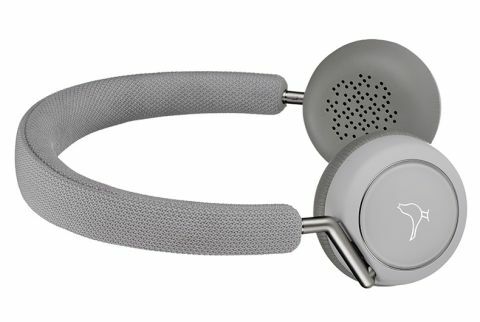 Libratone claims the headphones last for 20 hours of wireless listening after a full charge. That’s impressive range (and checks out in real life use) compared with the B&W P5 Wireless clocking in only 17 hours. However, neither surpasses Beats Solo 3 Wireless’s market-leading 40 hours. It’s not all wireless: there’s a 3.5mm cable in the box for those that prefer going wired (or for when the battery runs out). A microUSB cable is also included for charging, which takes roughly three hours from flat to 100 per cent. Like the Award-winning Sony MDR-1000X, the controls for the Q Adapts are housed in the earcups. The left holds the power button, which you can also press to find out how much power remains – LEDs on the right earcup light up to show how much is left: all lights on means a full charge. The right earcup is where all the action happens, with a variety of finger-taps and gestures letting you control playback, answer calls, adjust volume and noise-cancelling levels. According to Libratone’s instructions, it should all be straightforward. In reality, it’s anything but. The touch controls aren’t as intuitive as we’d like, requiring you to be extremely precise with where you tap on the earcup and how long you hold the tap for. It’s frustrating, as it takes us a couple of goes to get it right – every single time. It’s a shame, as the touch interface is a good idea, but you’ll need more patience than us if you can live without quicksilver response times. What does work smoothly is sliding your finger around the outside of the cup to adjust volume. Another neat touch is the headphones automatically pause music when you slip them off your head and start playing again when you put them back on. The headphones also feature Libratone’s CityMix adjustable noise-cancelling technology, which gives you four levels of effectiveness, allowing you to tune out or into as much of the outside world as you wish. You can cycle through the four levels using the function button on the right ear cup, or by using the visual dial in the app. You can also cover the earcup with your hand to active Hush – a shortcut feature that pauses music playback so you can hear a train announcement or a colleague’s conversation briefly. We’d highly recommend downloading the Libratone control app (free for iOS and Android) as it gives plenty more features, such as selecting three different EQs (neutral, bass or treble-heavy), checking battery status, updating firmware, adjusting the noise-control level and connecting a friend’s headphones to share your music via Bluetooth. The app is neatly designed and really handy, especially when the headphones’ touch controls give you trouble. Apple users can also summon Siri with a long tap. This feature and the app are available only when you’re connected via Bluetooth. With the What Hi-Fi? playlist on shuffle, the Libratones happily take on the eclectic mix thrown at them. From the dreamy trip-hop of Portishead to Dolly Parton’s country pop, with a detour through Spinal Tap’s none-more-heavy metal, the on-ear headphones’ open and affable presentation is an easy-going listen from the start. The Q Adapts start off a touch muffled – vocals in particular sound like they’re being sung through a funnel – so they do need a few nights’ running before they’ve cleared their throat and start singing clearly. Kate Tempest’s speak-singing comes through cleanly on Don’t Fall In, although there’s a touch of softness around the edges that damps down her razor-sharp lyrics. The outlines of notes are clean, but not as prompt as rivals such as the B&W P5 Wireless. Tempest’s rolling rhythm needs grip the Libratones simply can’t muster, leaving the song lacking in passion and verve. There’s enough detail to grasp the melody and fluidity of songs, but the headphones are vague when it comes to subtlety and deeper dynamics. They tend to skim the surface rather than reveal meaningful detail. The grungy, sludgy tones of Alice in Chains sound too polite, piano notes sound too thin and whimsical in Amanda Palmer’s Ampersand, and there’s no solidity to the soaring horns or the deep, huge drums in any John Williams-orchestrated soundtrack. On the plus side, Libratone’s warm and fuzzy balance means you don’t get any brightness or overly bloated basslines – they are a fairly inoffensive and pleasant listen. But it takes more than just pleasantness to make a mark in the headphones market, especially when you’re up against the Award-winning B&W P5 Wireless. At their new price of £230, they’re a step ahead in every way. The depth and dynamism achieved by the P5s is wonderful, with Nick Cave’s pensive, heartfelt vocals on People Ain’t No Good coming across with gravitas and texture. The Libratone headphones don’t have that satisfying punch or strict handling of rhythm that come so easily to the B&Ws. They can’t quite get our foot tapping – without a strong handle on precise rhythm or musical cohesion, they’re more a cursory listen than something truly immersive. It’s worth noting you get a touch more fluidity and subtlety when using the 3.5mm cable than when going wireless. The headphones’ adjustable noise-cancellation is decent, subduing the world outside just enough for you to still keep an ear out for train announcements. It’s serviceable, but it’s nowhere near the total silence you get with the Bose QuietComfort 35s or Sony MDR-1000Xs. Even on the highest noise-cancelling setting, you’ll still hear your colleagues’ chatter or the sound of cars whooshing by. These certainly won’t be the cans to take on long-haul flights if you want to block out the sound of the plane's engine. Libratone’s first foray into headphones is packed with great ideas, but the execution needs some refining. The build, comfort and features are all there, but fiddly touch controls and a pleasant, if unremarkable, way with sound means the Q Adapt On-Ears don’t quite reach the heights they were aiming for.